Many people in the developing world rely on open water sources that have no cover. An unsealed water source means water becomes dirty and contaminated, leading to the spread of disease. In more flat fertile areas, such as parts of South and East Asia, hand pumps are ideal for villages and households. Surface sources are common, so only a basic pump suffices for poor families trying to meet their water requirements. Suction hand pumps are cheap, easy to install and maintain. Maintenance is done at the village level without the need for specialist parts. The maximum column of water the pump can physically lift is approximately 7m. The pumps are made from cast iron. – A feedback report, in the form of a document, is provided for the construction of every hand pump. – The construction of a hand pump takes up to 6 months. – Plaque names of up to 30 characters are allowed on the pump, however ayahs from the Qur’an, Allah’s Names/Attributes or Hadiths are not allowed. The charity does not want these holy words to be desecrated. 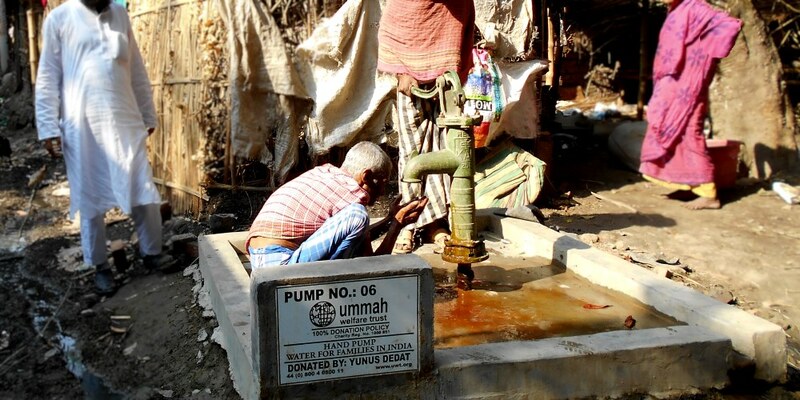 – If no name for a hand pump is given in the ‘notes’ of the donation, Ummah Welfare Trust will use the donor name given on the receipt for the plaque. hand pumps constructed in India during 2017.